Here’s an idea…take a vase and top it with a pinecone for an instant topiary. when we lived in Paris. 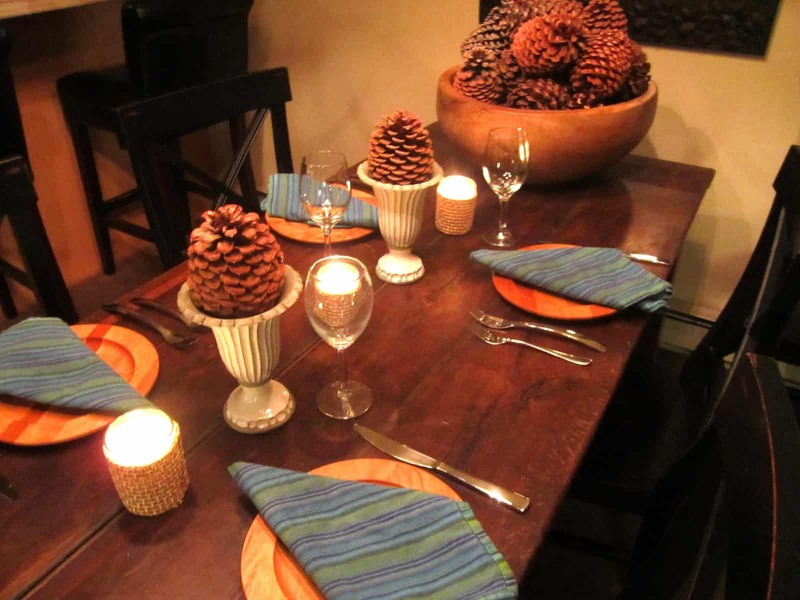 Get more ideas for decorating with pine cones from Vignette Design. There are tons of pinecones on the ground all over Mammoth right now. I pick up one or two when I am out walking our dog, Rocky. Here I am in red beating Howard down the mountain. That is a total lie. Not that I can’t beat him (perhaps… I wish). It’s just not us in the photo. that includes toasted pine nuts, lemon zest and garlic (I added fresh basil since I had some). It’s from the Barefoot Contessa “Family Style” cookbook. Have you entered the giveaway for it HERE? Dangerous!!! 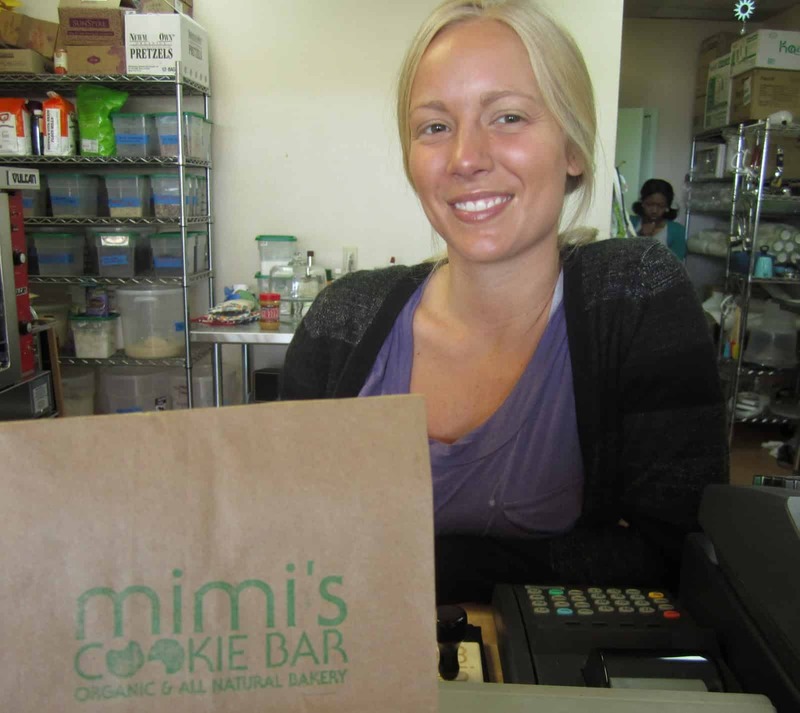 Literally around the corner from our condo is Mimi’s Cookie Bar. That’s Mimi in the photo. My favorite is the chewy pecan cookie. She has various, exotic hot chocolates, too. We will be spending Thanksgiving in Mammoth. The kids are flying in from the east coast. Where are you celebrating this happy occasion? Previous Post: « Outdoor Living, Healthy Snack & Giveaway! ANYhoooo, that PASTA looks sooooo GOOD (my weakness (! )… that and bread, OF COURSE! ), I got a good chuckle out of "the race" between you two (I could NEVER beat Jim either, dang it all!) and I must admit I wish soooo much we still had our ski place in Park City… That you are ALL able to be TOGETHER to share the holiday, and at Mammoth, no less, means you're going to have one WONNDERFUL T' GIVING!!! E*N*J*O*Y it all, sweet pal o' mine~~~ you soooo deserve it!!! Happy Thanksgiving! I'm very envious of your wonderful holiday – we Aussies have to settle for just looking forward to Christmas. 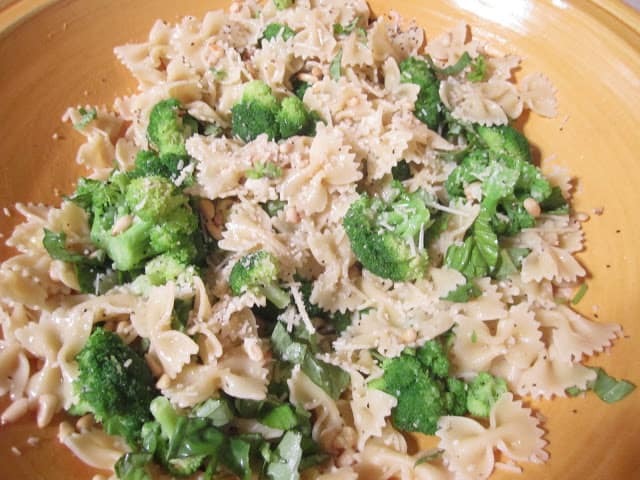 Love "your" skiing pictures….and your pasta dish looks yummy. Was hoping to be in new house, not looking so likely now but my parents will be here and I am choosing to concentrate on the fact that we will all be together, which is afterall the most important thing! Oh I love the bit about skiing with your husband. I too can never win – but we have a blast. Never met a pinecone I didn't like – thanks! I love the pine cone inspiration idea! Did anyone ever tell you that you are invited to a lot of beautiful places! Love the rustic simplicity of decorating with pine cones! We'll be traveling to Rochester to spend Thanksgiving with the in-laws and my extended family. 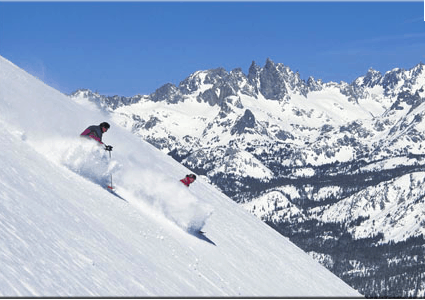 Mammoth Mountain looks like a wonderful place to be celebrating with family. Thanks for sharing. LOL i love this post, especially the title. We have never skied there before! What a great place to spend Thanksgiving. We are hosting here at home in Birmingham. But we will be spending Christmas in Beaver Creek, CO.
LOVE the pinecones. 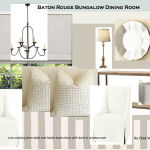 Perfect for a mountain retreat! Looks like you'll have a wonderful holiday. Love those big pinecones. Doesn't nature have such beautiful things? Great table! I love that you have the sunny coast of CA and the mountains – how lovely! 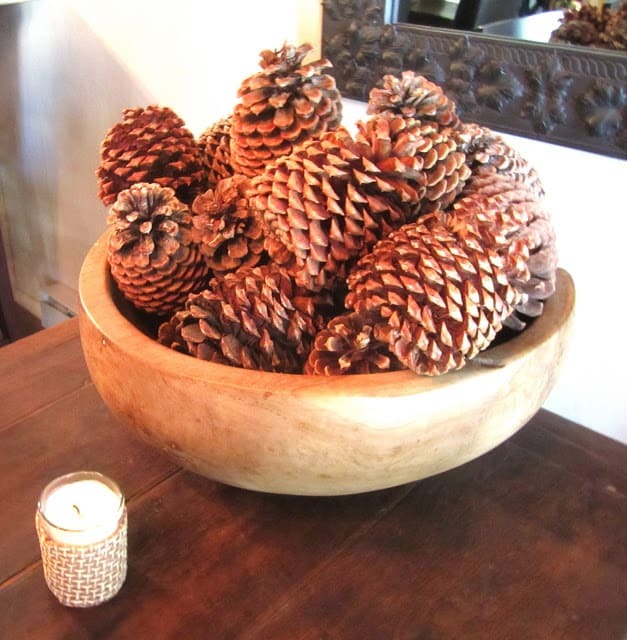 I'm a big fan of decorating with pinecones too…..seeing as they litter our yard in the winter! I have a few massive (mammoth!) ones that I display on our bookcase year round. Love. I love the pinecone topiary. Sometimes the simplest things really are the best! That cookie bar would be very dangerous that close to me.Forget candy, ice cream….but cookies? watch out. Love the pinecones too! 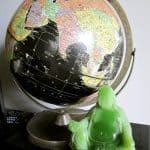 I loved this post! You conveyed the wintery mountain vibe so well! It sounds like you will have a great time and I hope lots of snow! Happy Thanksgiving! Jealous! Know that you are having a blast! Aren't pinecones natures perfect little gift? Always so uniform and a perfect decoration. Love your idea, Mary Ann. Have a great time. What a great place to spend the holiday. I don't ski but I could get quite comfy at Mimi's! The pasta looks delicious…we are trying to cut out so much meat during the week so I have been loading up on pasta recipes. This looks like a winner! Thanks! Sounds like a wonderful Thanksgiving away! Love the use of pinecones in decor this time of year. The pasta salad looks divine too! I love pine cones and I love that elements from the earth can pack such a punch with tablescapes and decor. 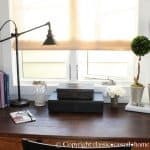 I was just commenting on another blog and saying how easy and inexpensive it is to get some pumpkins, flowers, sticks, (also pine cones) – throw in some candlelight – a great presentation! Mimi looks like my dental hygienist. hehe. And we will be having Thanksgiving at my MIL's house. My husband is one of 8 children so there's always a lot of whoopla going on – but fun! Enjoy your time with your family! Love the pine cone topiary! Such a cute idea! Love the pine cone topiary idea! We planted a bunch of Norway spruce trees several years ago, so I'll have to send the kids out back to collect the pine cones. Well, as fabulous as Mammouth Mountain sounds, I'll be heading to everyone's favorite vacation destination… Cleveland. I didn't enter your giveaway, because I already have (and love)the book. However, I have not tried the dish you featured yet. It looks fabulous! Great table decoration…and that snow! Powder snow in Australia is a rare event. It is usually heavy and wet! i wish i could still ski. i blew my knee skiing. but aren't we kinda lucky that the kids are in college?? I have lots of great memories of skiing Mammoth. Enjoy your family and be safe! Mammoth sounds wonderful. We are having a very different holiday this year. My children will not be here. It will be very quite. We are going to spend it with friends. I love the pine cone topiary!! It looks fabulous.Dinner looks so good too. Love those giant pine cones! Such gorgeous pinecones, where do you find such large ones? I have lots of small ones. I love decorating with them. You really have the best of both worlds…the beach and the mountains. Growing up in Colorado, I really miss it when I see shots like that…blue sky and great snow! 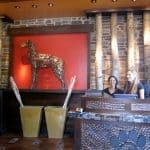 I love your pinecone decorations and dinner looks pretty yummy too! i LOVE your table…what a great keepsake from Paris! WOW those pinecones are HUMONGOUS!! I love picking pinecones in my morning walk. 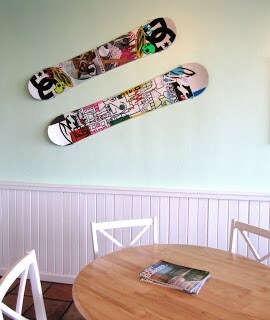 Nice table setting. This Thanksgiving 1st going to the Macy's Thanksgiving Day parade. The pine cones are huge! Love your topiary pine cone idea! Love your farm table, by the way! You scared me when I saw the skiing picture!!! 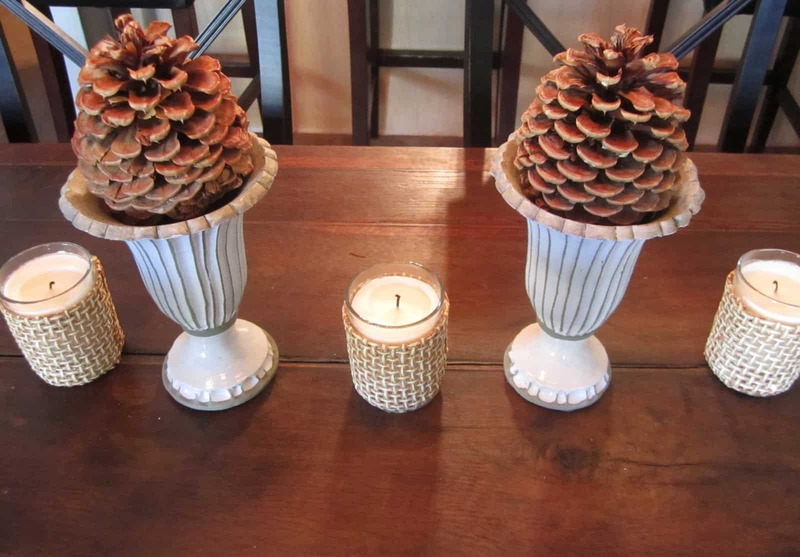 I love to use pinecones during my holiday decor…they look so pretty with greenery. Have a wonderful time with your family. Your pinecone arrangements look so nice. I've always loved using pinecones for Fall and Christmas arrangements. Looks like I'm in good company. 🙂 Happy Thanksgiving. Wow…those are really nice sized pine cones! We don't get them that big here in the Kansas City, MO area. I wish we did. I have seen the huge ones sold in stores around town for monstrous prices, but I haven't bowed yet. They sure are pretty, though. Great idea on the instant topiary! Sounds like Florida didn't work out but a holiday in the mountains sounds perfect. I have always wanted to do exactly what you're doing but everyone likes being home. I guess I am the only one who thinks cooking in someone else's kitchen would be exciting and fun. 🙂 Love the pine cone topiaries. You are so creative. Have a lovely, white, Thanksgiving.